The English did both good and bad during their occupation of India as a colony. It is unclear what their legacy is. Certainly Indians have acquired cricket as their own and, in short forms of the game, are now the masters. More important, Indian cuisine is one of the world’s greatest. It is also the first national cuisine of any merit that I learned to cook. I say “of any merit” because it is difficult to think of English food during the 70’s as having any real merit. Madhur Jaffrey was to Indian food in England as Julia Child was to French food in the United States – and at approximately the same time. 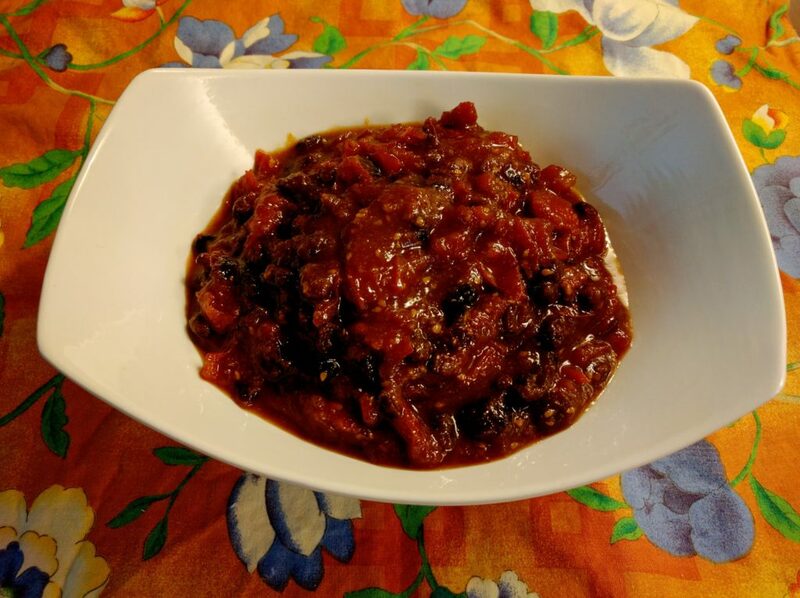 This is one of her recipes and is one of the tastiest and most versatile chutneys. It is also very easy to make. I have adapted it to suit my tastes and you will want to adapt it to yours. 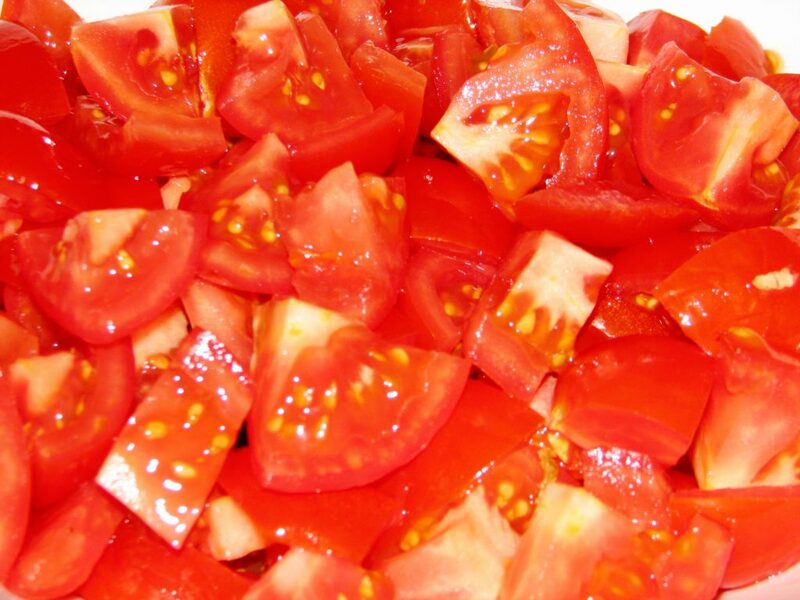 For example, to ensure the tastiness of the tomatoes, she uses canned tomatoes. 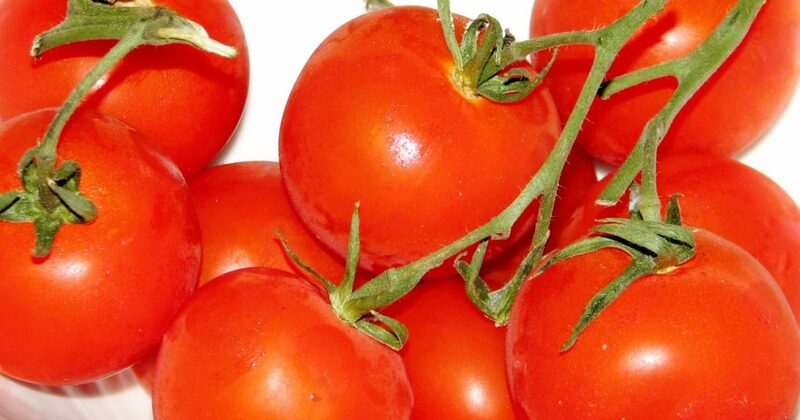 I had access to really sweet cherry tomatoes and substituted this almost candy-like strain and was delighted. I also like my food rustic, so I sliced them in half and left the skins. 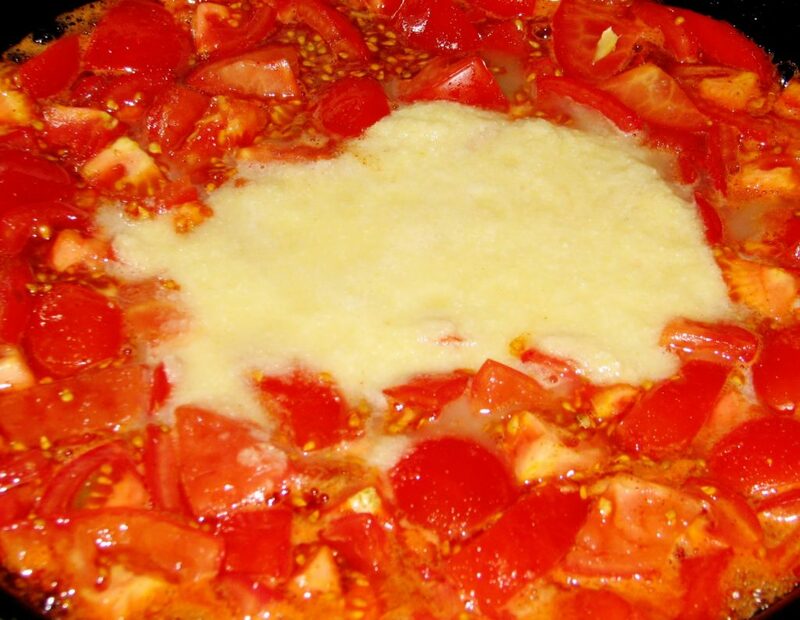 I want the chunkiness of the tomatoes and the chewiness of the skins. I was also not going to skin a pound and a half of cherry tomatoes! Be bold with the garlic and ginger. Don’t be a wimp! So be bold. Make changes. Listen to your taste buds. *EXCEPT* Listen to Madhur, she knows what she is doing. The first ingredient is garlic.. a whole head of garlic. Not a clove of garlic.. the whole head. DO NOT WIMP OUT! if she says head, use a head. You will not just enjoy the final product, you will enjoy authentic Indian flavor. 1 head garlic, peeled,coarsely chopped. 1 piece fresh ginger, about 2 inches long, 1 inch thick and 1 inch wide, peeled and coarsely chopped. 1 1⁄2 cups rice wine vinegar/red wine vinegar – whatever your taste. 1 1/2 lbs of tasty fresh tomatoes. 1 1⁄2 C of brown sugar. 1/2 C raisins (I think that the original calls for 2-3 T, but I love ’em!). 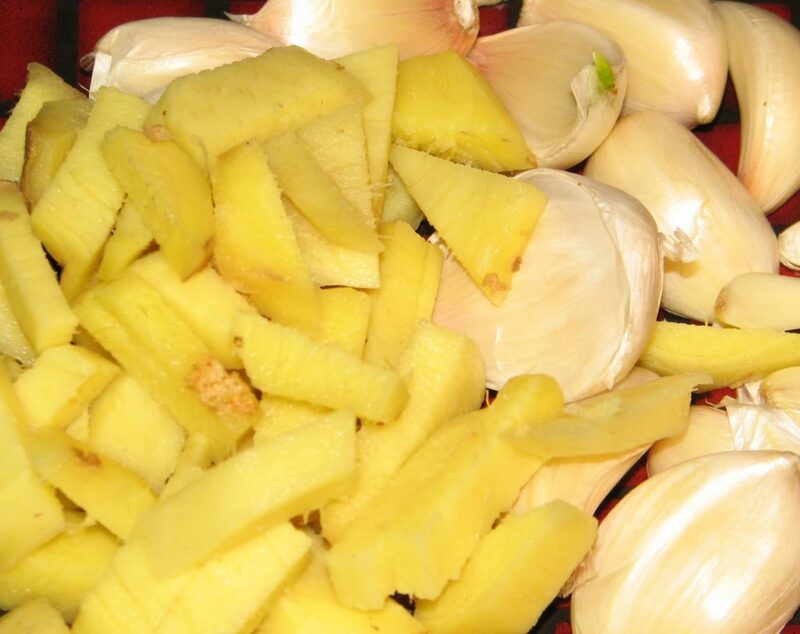 Chop garlic, ginger and add to a blender with 1/2 cup of the vinegar. Blend until smooth. 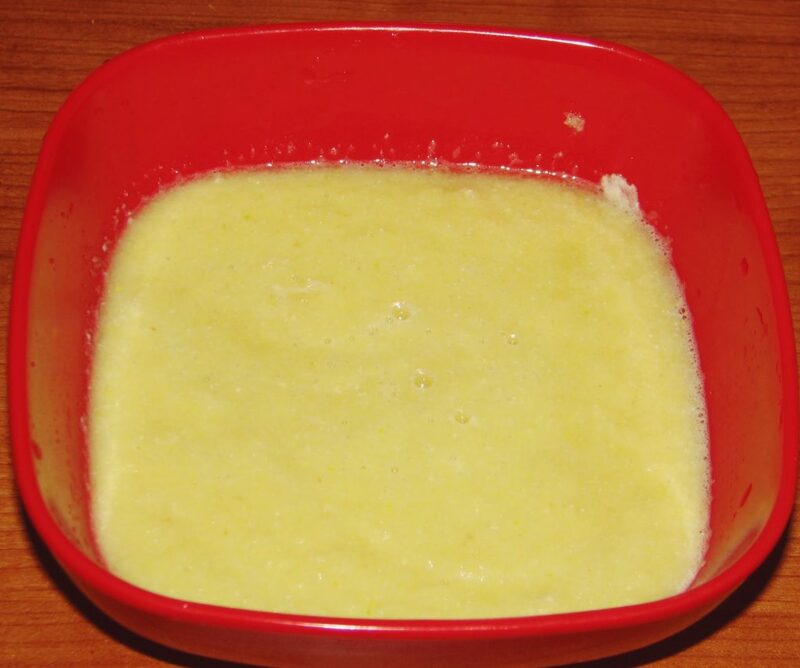 In a non-reactive medium sized saucepan, add the rest of the vinegar, the sugar, salt and cayenne pepper. 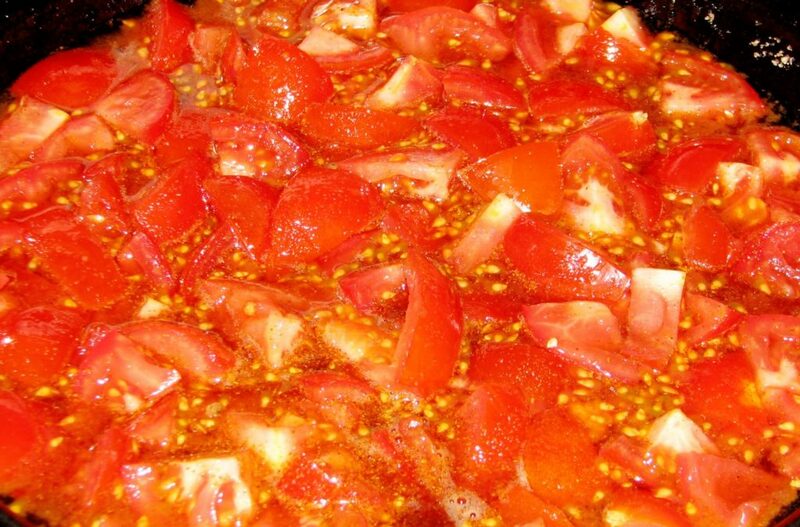 Simmer your tomatoes and spices. 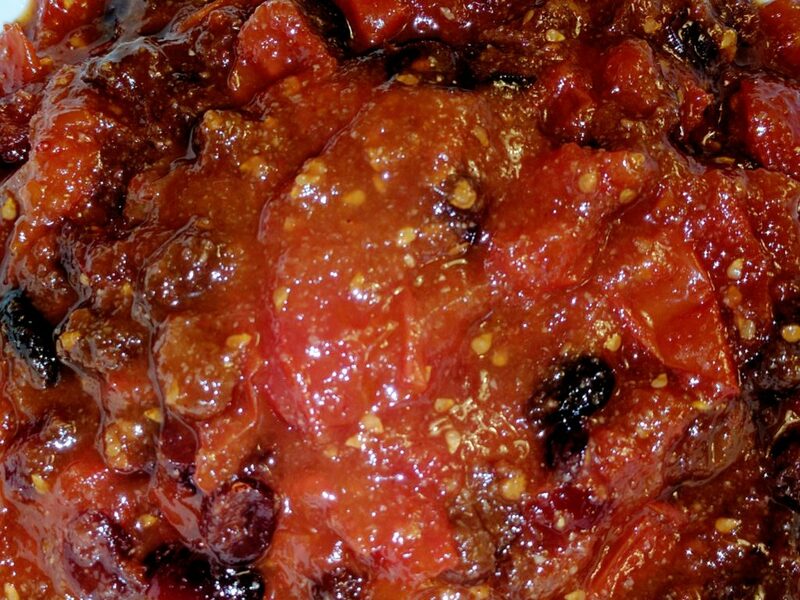 Lower heat and simmer gently, uncovered, for about 1 1/2 to 2 hours or until chutney becomes thick. Stir occasionally at first, and more frequently later as it thickens. It will also thicken as it cools. Rustic texture of my version. This is a huge bowl! A little goes a long way. Add raisins 30 minutes from the end of your cooking time. This allows enough time for them to plump. Keep refrigerated and this will last months. Eat with cold meats and cheeses.